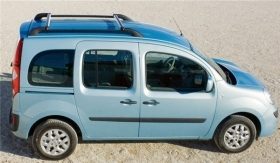 Mercedes plans to sell a van based on the Renault Kangoo, shown. (Bloomberg) -- Daimler AG's Mercedes-Benz unit plans to sell a small van built on a Renault Kangoo platform starting late next year, AutoStrassenverkehr reported, citing unidentified people inside the company. The van will be built at Renault SA's Maubeuge, France, plant as part of the manufacturers' cooperation agreement and is set to sell at “well under” 20,000 euros ($27,000), the magazine said.